The Mauler spreader bar is constructed of a durable Stainless Steel bridled 36 inch bar. We use 150lb test mono and eleven 7 Inch Premium SQUIDNATION Mauler Squids. We rig a 275lb swivel at the end so you can attach your favorite hooked bait. This Spreader Bar is a Tuna catching machine. 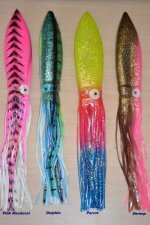 It is available in all the colors offered in our 7" Mauler Squids. Contact us for custom color combinations! Sale Price: $74.99 / ea You Save: $25.00 (25%)!